The new Broadway revival of Rodgers & Hammerstein’s “Oklahoma!” could be compared to a surrey with a little too much fringe on top, to swipe the nearest metaphor. It may get you where you want to go, but you might not be able to enjoy the trip as much as you’d hoped to because you’re too busy taking note of all them gaudy bells and whistles. Presented in the fall at St. Ann’s Warehouse in Dumbo (after originating at Bard College), the show was an instant sellout that had critics throwing their proverbial Stetsons in the air. The production, directed by Daniel Fish, has now transferred to the Circle in the Square Theatre with most of its cast — and all of its fashionable downtown-theater tropes — intact. I’m afraid my proverbial Stetson remained in my lap throughout, even when I was often happily tapping my toes. No one who has followed theatrical trends of recent years will find anything particularly surprising in the staging. Ivo van Hove, whose production of “Network” is now on Broadway, has practically trademarked the use of live video in his productions, resorted to briefly here. (The Wooster Group, and others, have been using similar technology for decades.) The house lights remain on for much of the show’s running time, simulating the “immersive” theater trend that has been percolating for years now. The most welcome, and most stimulating, innovation is the fresh orchestrations, by Daniel Kluger, for a small band seated in a pit onstage. 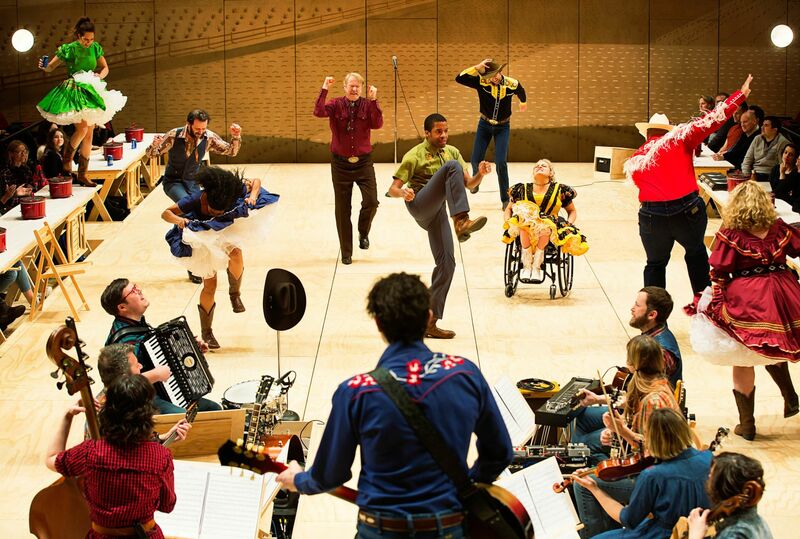 The instrumentation favors guitars, banjo and accordion, and while Broadway musicals usually feature more robust and varied orchestrations, Kluger’s arrangements, and the terrific music-making, gives the show an authentic-feeling countrified flavor that makes the classic songs soar and leap with a new, spirited sound. The generous doses of comedy in Hammerstein’s book are rendered with equal vibrance. The evening’s standout performance comes from Ali Stroker, as a marvelously sly, silly and sensual Ado Annie, the “girl who cain’t say no” to any beau who strays into her path. Stroker’s plush twang adds terrific comic seasoning to both her singing and her romantic dalliances with the two rivals for her hand (or at least her lips), the sweetly naive and thoroughly besotted Will Parker (a hilariously dim-witted James Davis), and the Persian “peddler” Ali Hakim (a nicely deadpan Will Brill), whose affection for her is more casual — at least until he finds himself staring down the barrel of her father’s gun. Likewise making the most of her considerable comic opportunities is the reliably excellent Mary Testa, ideally cast as Aunt Eller, who brooks no nonsense from her niece Laurey Williams (Rebecca Naomi Jones), and presides with abundant delicacy — or, when called for, bluntly manipulative force — over Laurey’s romantic confusion. Deeply attracted to the cowboy Curly McLain (Damon Daunno), Laurey nevertheless is corseted by her pride, and finds herself promising to attend the shindig at the center of the plot with the farmhand Jud Fry (Patrick Vaill), for whom she feels no affection, and from whom she secretly shrinks in instinctive fear. It is in delineating the contours of this central romantic trio that Fish’s “Oklahoma!” disappoints. While Daunno has an easy, self-regarding swagger, his cockiness tends to be his only discernible trait; the sensitivity that initially has Curly shying from making a forthright declaration of his love is barely glimpsed. And as Laurey, Jones similarly skims along the surface of her character, with the deep yearning — for things she cannot always put a name to — remaining muted. The lack of an intuitive rapport between Laurey and Curly, and the failure to draw these rich characters in sufficient depth, drains the emotional stakes in the production. And so you may find yourself wondering why, for instance, the potentially powerfully disturbing scene between Jud and Curly in the first act, when their antagonism over Laurey simmers dangerously, is performed almost entirely in the dark. To suggest the complete psychological isolation of Jud, presumably. But then why the addition of live video, projecting Jud’s blank-eyed, mournful face on the back wall of the set? You may also ponder why, while all the other characters are costumed (by Terese Wadden) in cowboy boots and denim that blends eras, Jud, in his tattered sweatshirt and plaid shirt, seems to have wandered in from Seattle circa 1993. Again, perhaps to suggest his alienation, but that might be better expressed through a more nuanced performance. Vaill’s blandly sullen Jud, like Laurey and Curly, lacks emotional texture, the kind of agonized self-torment that typically makes him a painfully sympathetic villain. In this production, I found myself thinking that if someone had given Jud a few Paxil and handed him back his Pearl Jam records, he’d happily ride off into the sunset. Which brings us to another much-discussed innovation in the staging: the (supposed) prominence of firearms. True, holsters and guns are on frequent display, but most of the references come straight from Hammerstein’s original book. And the arraying of antique rifles across the theater’s walls almost undercuts the production’s vaguely suggested anti-gun message. (In response to the presence of firearms in the production, the show has announced that it will donate $10,000 to a gun-control initiative.) They are so daintily pretty they scarcely hold any menace; they might as well be arrangements of Wedgwood china. Only the climax has been changed radically to emphasize the danger of firearms, with Jud (spoiler coming) presenting Curly with a gun as a wedding gift, and almost ritualistically offering himself up to be slaughtered. (In the original, as most will recall, Jud draws a knife during a fight with Curly and accidentally falls on it.) It’s a peculiarly ineffective change, as it plays dramatically flat — neither Jud nor Curly radiates in the moment much sense of impending violent conflict — and ends in a gory tableau that suggests Curly, and by extension even Laurey, are implicitly guilty of murder, which is hardly what Hammerstein intended. Some of Fish’s innovations are truly clever. Having the female characters snapping phallic ears of corn in two as they perform “Many a New Day,” in which Laurey sings of her (not entirely authentic) independence from any romantic attachments, is a delightful, bawdy image. And Ado Annie’s flirtation with a man, or more than one man, seated onstage, is an instance of fourth-wall-breaking that’s both funny and true-to-character. But too often I found myself weighing the moments of inspiration against the moments of bewildering distraction (why do the characters occasionally, but just occasionally, sing or speak into microphones? ), rather than engaging emotionally with the underlying material. The core of rich feeling at the heart of the musical remains unexcavated, so these moments of quasi-Brechtian distancing keep us from experiencing the real kind of immersion we look to from the theater: immersion in the exploration of human love and desire and suffering. These very themes were rendered with such purity and poetry in the original “Oklahoma!” that it forever changed the landscape of the musical theater. “Oklahoma!” opened at the Circle in the Square Theatre on Sun. April 7, 2019. Creative: Original choreography by Agnes de Mille; Book by Oscar Hammerstein II; Music by Richard Rodgers; Lyrics by Oscar Hammerstein II; Based on the play ‘Green Grow the Lilacs’ by Lynn Riggs; Music orchestrated by Daniel Kluger; Music arranged by Daniel Kluger; Directed by Daniel Fish; Choreographed by John Heginbotham; Scenic Design by Laura Jellinek; Costume Design by Terese Wadden; Lighting Design by Scott Zielinski; Sound Design by Drew Levy; Projection Design by Joshua Thorson. Producers: Eva Price, Level Forward, Abigail Disney, Barbara Manocherian & Carl Moellenberg, James L. Nederlander, David Mirvish, Mickey Liddell & Robert Ahrens, BSL Enterprises & MagicSpace Entertainment, Berlind Productions, The John Gore Organization, Cornice Productions, Bard Fisher/R. Gold, LAMF/J. Geller, T. Narang/ZKM Media, The R/F/B/V Group, Araca/IPN, St. Ann’s Warehouse, Tamar Climan and Bard Summerscape. Cast: Will Brill, Anthony Cason, Damon Daunno, James Davis, Gabrielle Hamilton, Rebecca Naomi Jones, Will Mann, Mallory Portnoy, Ali Stroker, Mitch Tebo, Mary Testa, Patrick Vaill.